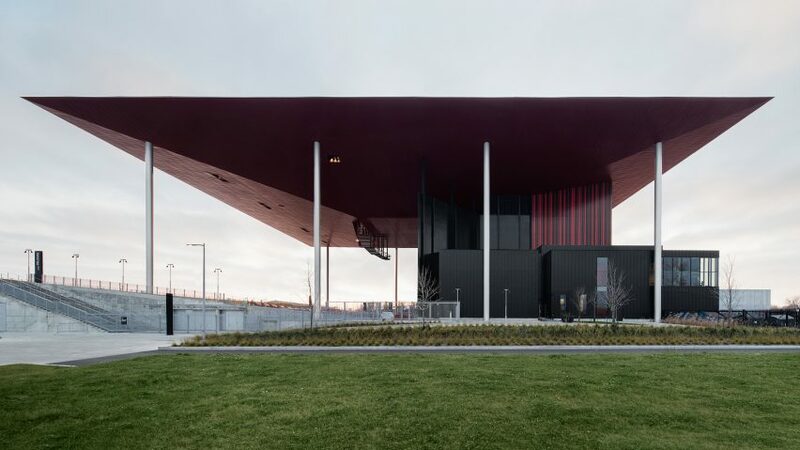 A huge roof clad in red-hued metal panels spans above this open-air theatre, which Canadian studio Atelier Paul Laurendeau has built on the waterfront of Trois-Rivières in Quebec. The Amphithéâtre Cogeco is located in the east of the city at a corner point where the Saint Lawrence and Saint-Maurice rivers meet. The site was formerly an industrial area and is undergoing regeneration, with plans including a host of cultural facilities and public spaces, as well as promenades and boardwalks. The Montreal-based studio built the outdoor theatre as part of this scheme, replacing an old paper mill that closed in the early 2000s. The team was awarded the project from a contest in 2010. Laurendeau said the brief asked for a "landmark design of an international scope, comparable to the Sydney Opera House fronting the water". To achieve this within a fairly tight budget, the team – including collaborators local firm Beauchesne Architecture Design – decided to make a statement out of the roof. Measuring 7,200 square metres, the huge canopy is bigger than necessary, and is raised 26 metres above the ground to meet the height of the theatre's fly tower. It covers over 3,500 fixed red seats in the outdoor theatre, which can also operate in "mosh pit mode", accommodating nearly 9,000. An accompanying 5,200 can be placed on the raked grass beside. "The architectural parti exploited a fundamental core element of the programme: a roof that protects the public from the rain," said Laurendeau. "Intended in the programme as a low element, limited to the fixed seating area, it was raised at the level of the fly tower to embrace it and extended beyond its initial limits to form an 80-by-90-metre rectangle on the horizon." The underside is tapered so that the rim is just 6.4 millimetres thick. At the centre, the depth increases to six metres to house the theatre's galleries, including stage equipment and lighting. Eight slender steel columns that support the roof are 850 millimetres in diametre and painted white, arranged in rows down the side to leave the view open to the waterfront. Galvanised steel panels coloured red are used to clad the underside of the roof, and to reflect artificial light at night. "The roof soffit, in a last minute decision, was painted a bright red," said Laurendeau. "At night, it turns into a glowing inverted curtain, lit by recessed projectors at the base of the silver painted columns." Behind the seating, on a concrete wall facing towards the water, the studio has mounted a huge black sign spelling Trois-Rivières made of laminated timber panels. While other outdoor theatres – like a cruciform-shaped pavilion in Copenhagen and one made of the Netherlands made of wooden cubes – are temporary due to weather limitations, the Amphithéâtre Cogeco will be used all-year-round. Accompanying the theatre, which is named after telecommunication company Cogeco, are an indoor bar, cafe and lobby. These are housed in a series of volumes clad in black metal that surround the flytower covered with alternating vertical black and red strips. Double-height glass walls encase the foyer offering views to the open plaza is placed in front, where crowds to gather before and after performances. A bar is placed to one side of the foyer. On the other side a tall gap in the other black side wall provides access to the bathrooms and VIP seating area marked by red walls. "Rather than a typical door, the opening creates a dramatic transition between spaces," said the studio. "As one enters, two red side walls appear, simulating a curtain effect and signaling the corridor that leads VIP guests to the left and towards their seats." The stairwell leading down to the backstage area is also completely red, and lit by strip lighting mounted underneath the stairs. Photography is by Adrien Williams, unless stated otherwise.